Feedmax 2, hay feedout trailers from Ashmore Engineering tease out hay into windrows. This makes the hay softer and easier to stock and therefore increases it’s feed usage. This all means that the hay increases in feed value. Windrowed hay allows for even access to the hay for all stock. Contamination and hay wastage are both reduced. Feedmax hay trailers can be used to tease out bales with excessive moisture content for re-baling. The Feedmax 2 has the ability to vary both the drive speed of the rotors driven by the tractor PTO and also the rate of feed of the bales to the rotors. This can determine the size of the windrow produced and enables a variation in the coarseness of the material made. 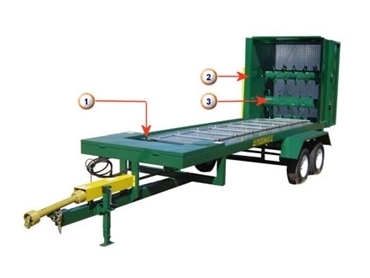 The hay trailers can carry 2 8x4x4 or 8x4x3 and can also accommodate for round bales.